(Crisis Magazine) Here we have two recent Cathedrals of similarly grand scale and with contrasting architectures. The juxtaposition of the two styles makes an interesting case study for the “traditional versus modernist” debate over which architectural style is most appropriate for worship. Debates of this kind usually begin over obvious characteristics of style. But following a close examination of these two buildings, the less obvious elements turn out to reverse first impressions. The issue then becomes very complicated, and, in my opinion, far more revealing than a superficial debate based upon style. This discussion brings up issues on today’s approach to church planning. First a disclaimer: I have visited neither building in person, yet that is the only sure way of experiencing a structure. For this reason, my review is bound to be incomplete and partial. 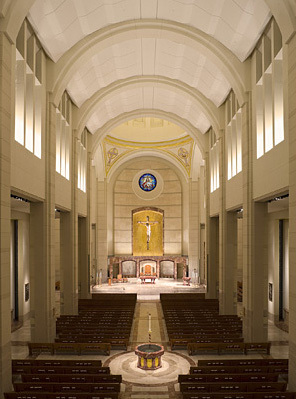 The Cathedral of the Sacred Heart in Houston, by Ziegler-Cooper Architects, is in obviously traditional style. This is an accepted tendency in many post-war churches, with a high, open, vertical entrance. It is an excellent idea to use, or rather, re-use traditional typologies for the ancient act of worship. Those who support tradition over innovation in Church architecture (and in the Church itself) see no need for any further justification. The human being is tied to God through ritual over millennia, and the best architectural solutions are those developed over time. An intelligent and sensitive architect can use them in a contemporary context with great success, and that is what has been achieved here. Tried-and-true methods are used to design a building that is solid on tradition, reassuring in presenting the Church of tradition to the faithful. The Cathedral of Christ the Light in Oakland, by Skidmore Owings & Merrill Architects, is a postmodernist innovation, expressing new forms and typologies. It presents one of many possible answers to the question of “how can we extend the traditional ecclesiastical typology using new methods?” At first glance, it is a very successful innovation indeed, creating space, light, and a feeling of openness, as an attractive alternative to neo-traditional designs. The materials are certainly innovative and play a major role in the impression the worshiper experiences inside the Cathedral. 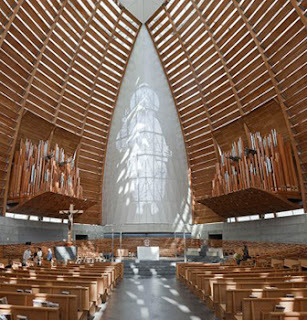 The Church is pressured both by its members and by its administration to appear innovative and not retrograde, so such a commission is seen as an advance in the sponsorship of contemporary forms for Church architecture. There the matter would stand in a limited but superficial comparison: a traditional building versus an innovative building. Both would appear to work well, and if they were not separated by such a great distance, they could offer a choice to churchgoers who had the corresponding philosophy of their own, namely traditional versus contemporary. But things are not so simple. Let us look at the details and interior spaces. The Houston Cathedral has an unexpectedly non-traditional aspect when examined more closely. It feels like a building from the Vienna Secession: rich materials, yes, but also planes that are not filled in, and abstraction in its volumes. This is not a traditional building by far. It is not a Cathedral that any of my friends who design traditional churches would have built. They would have stuck to more of a traditional style in all the details (with magnificent results by the way). Here, instead the architects have achieved a harmonious result by pushing traditional typologies and ornamentation as far toward modernism as is possible to go without losing everything. We are reminded of the Vienna Secession and Art Deco, that glorious flowering of innovative architecture just before architects eliminated every vestige of tradition (and most of the architectural rules that touch us in a healing manner). I am forced to revise my initial hasty opinion and declare this building highly innovative. The innovation is employed to give a very positive impression: this is the reason the building looks comfortable; it looks traditional even when it is actually not. I am impressed by the result and warn other observers not to be taken in by a superficial judgment. This building is “modern” in every positive meaning of the word. I caution, however, that it comes close to being “cold” in those places where its approach to abstraction is the strongest. 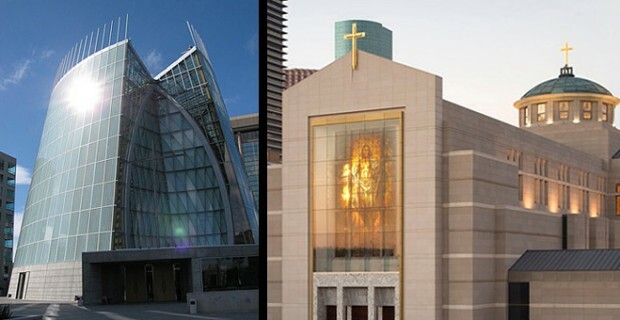 What could have been done to improve the Houston Cathedral? The answer is obvious, although not implemented. My friends would have put in those smaller details that come from traditional ornamentation at the smallest scales, even if very restrained. Or its architects could have devised their own form language on those small ornamental scales. The eye needs ordered structure just a little larger than the rich granularity in the natural materials, and that is missing here in some places. By imposing restrictions in its form language on the smaller scales, the hierarchy is lost going down to details. Could you please get in touch with Father Levis and let him know that his friend and EWTN Q & A backup Andy Piacente aka Doria2 has passed away. His wife Marie just emailed to say her husband passed away peacefully this morning surrounded by his family. He was recently diagnosed with cancer and as recently as a few weeks ago was still fighting for the Faith with his emails. Thank you.